For the past 18 months I've been finding it easier to tap into communities on Medium, the blogging service, and our team have a 'Magazine' blog where I've taken to writing a lot more frequently than here. Please have a look, and you'll find out that far from neglecting this blog, I've really got back into loving writing! This entry was posted in Professional on 19 January, 2018 by Ewan McIntosh. Once again, I've analysed my year of travel to see if I'm any closer to reducing it year on year. It's an annual habit, and if often kicks off new ideas that might affect my team's next year of work. The good answer is: yes, there is less travel! And not just that, but having reduced the schlepping I do, I've been able to hire more amazing people to lead on our work, and celebrate one of NoTosh's best years ever in terms of the quality, quantity and breadth of work we're doing. Key to traveling less has been a marked increase in the number of folk who see and are now reaping the value of working with us online. I've avoided as many as 20,000 miles of travel thanks to greener clients, who are also many dollars better off having not paid for the airmiles that are wrapped up in our regular fee structure. The quality of our work is better, too, thanks to this. We are doing fewer of those day-long workshops with teachers or leaders, when an hour or even thirty minutes before the day gets started is more worthwhile. We're seeing more school leaders take this up, although it's harder to get teachers into the habit of taking 30 minutes 'me time' to jump into a coaching session on the day or week ahead. But it's starting, and the value to us all is huge. Coaching is very different to 'consulting a Personal Learning Network' on Twitter. It's intense, targeted, focussed and involves a one-on-one discussion that arrives quickly at resolutions to current day challenges that will have a long-term impact. And we come back to measure whether that impact actually happened. I don't think it's a way of working that many are used to in Education, although many corporate clients have had some rare experience with it. Encouraging both groups to take more regular time out for coaching, little and often, is a real challenge, but we're beginning to see some huge impact from relatively little input (and relatively few dollars!). In 2017, my whole team plans to make more varied use of online coaching, in an effort to wean more clients into this way of working. The face-to-face stuff that really needs travel will still happen, and we'll enjoy it even more, I'm sure. This entry was posted in Professional and tagged 2016 on 27 December, 2016 by Ewan McIntosh. This Tuesday, I want you to join me in the pub. It’s your homework. There will be a test. My old tutor from teacher training college, David Muir, giggles as he types up some gems being shared over a beer between two other men: John Johnston, a primary teacher from Glasgow, and Will Richardson, an international keynoter whose formal talk earlier in the day had left us asking what they did in New Jersey that was, actually, any different from what we did in Scotland. Bob Hill from Dundee and Andrew Brown, a local authority (or school district) geek-in-residence listen in, priming the anecdotes they’ll respond with shortly. Behind me, at a different table, are a few others, snuggled around a table listening to the gems coming from an old uni pal who’s just started teaching, Grant Fraser. 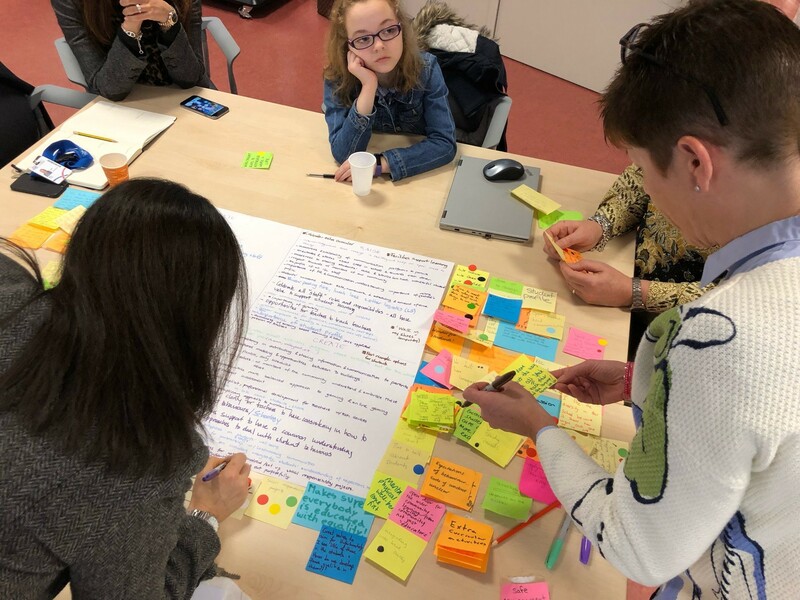 It doesn’t seem like much, but this informal gathering, arranged in fewer than 24 hours, was the first unconference for teachers, anywhere in the world. As we organised it through IRC, for lack of a Twitter quorate, and blogs, we called it the ScotEduBlogger Meetup, but that very night we decided that this might be a tad limiting, given we talked about more than just blogs. We also realised that if we wanted any women to make it along, we’d have to break free from what was, at that time, the mostly blokeish pastime of blogging. TeachMeet was born. And it was a full four years ahead of its American cousin, EdCamp. The parents of TeachMeet were, from the start, against it becoming monied, sponsored or financially supported beyond what was necessary to make it work, commercialised in any way, or becoming too formal by requiring a board, or trustees, or organisers. The lack of politics with a small ‘p’ was refreshing for teachers who mostly inhabit a world full of it. The lack of cash? Well, we’re teachers. That’s considered normal. I don’t know what I’d do with$2m, but I doubt it’d help make TeachMeet any more popular than it is today. Over the past ten years, it’s been a challenge to maintain that attitude in the heads of everyone who’s involved, but it’s managed to remain a very different beast to its EdCamp cousin as a result. It’s a difference I love. More than just a random bunch of teachers heading out for a midweek pint, this was planned, intentionally, to be the antidote to the Edinburgh City Technologies Conference, which had left us all a bit deflated. In our classrooms, we were doing more interesting stuff, frankly, than that talked about by the experts and commercial outfits vying for business back at the conference centre. I remember a discussion on IRC, about whether we should even invite Will along, given he was the keynote speaker that day, and somewhat occupying the podium that we were wanting to rebuke. A few of us knew Will well enough, though, through his blog posts, and thought he’d get into the ‘real’ goodies over a pint, more readily than in front of a few hundred folk in a beige convention centre. 5. If you do need to show something, for goodness’ sake, don’t do a PowerPoint (see Point 4, above). The most unwritten of all the ‘rules’ is maybe that of the Master of Ceremonies. In the pub setting, there’s always an MC. Sometimes they’re a total pain the neck. The loud chap in the corner, probably in a double-breasted suit, prophesying at his loudest and brashest to anyone who’ll listen, berating those who speak during his wife’s karaoke attempts, or who disagree with his political persuasion. The more successful MC is almost invisible through their prowess. Any good pub has one. Sat, not stood, in a central position of the bar. He keeps an eye on the action, and subtly moves the pieces around like a chess master. A small utterance now and then turns potential discord between patrons into uniting harmony. His own stories normally get saved to last, until the after-hours lock-in, where a few lucky souls will get the résumé of the evening that no-one else was able to see. From that night, we’ve written down most the rules, sighed when we’ve seen them forgotten. We’ve run some bigger TeachMeets, snagged some amazing venues, spent a lot of businesses’ cash on free beer and pizza. We’ve seen other countries adopt TeachMeet as their own, a few claim credit for starting it. We’ve seen TeachMeets sizzle when they offer something different for the teachers who come, and we’ve seen them stumble, stutter and stoater out as hosts forget how to really make those segues shine the spotlight on the teacher (and not the MC). We’ve kept the chaotic wiki where people organise, sign up and talk about their events. It’s got the look, feel and usability of your aged granny’s family anecdotes, but it’s for that reason that we keep it and love it (it is down as I try to link to it…). This Tuesday, 10 years on to the night it all started, I’m going back to the Jolly Judge Pub in Edinburgh. I’d love you to join me if you can. In an age of Facebook Live, Twitter, Medium and Instagram, maybe you’re expecting to join in virtually. The point is, I’m going to be in an Edinburgh pub. What do you think I’m going to do? This entry was posted in Professional and tagged 2016, TeachMeet on 21 May, 2016 by Ewan McIntosh. This entry was posted in Professional and tagged creativity, Languages on 25 March, 2016 by Ewan McIntosh.